Rethinking how we train Commonwealth teachers takes ambition and adaptation. It means being unafraid of challenges and seeing them as opportunities to be better, bolder, and braver. It means making sure that every obstacle is a catalyst for improvement. As we progress with our Teach2030 pilot programme, CET is embracing innovation wholeheartedly, building a better programme as we go along. This pilot has proven that our model can be, and is, successful. We developed Teach2030 with the aim of providing enriching materials shared through engaging delivery to enhance teacher practice. We make sure that participants are supported throughout by local facilitators, their peers, online communication and collaboration. Learning is applied to the learners’ own contexts, allowing participants to focus on their individual challenges, at their own pace and at a time that suits them. This is all supported by a cycle of reflection enabling participants to identify their strengths and areas for development, with communities of practice providing a network for teachers to support each other to develop. While this success is welcome, it has not come without some challenges and learning opportunities. We found that the varying skills of the teachers in our pilot programme was impacting the delivery of our learning materials. While every teacher wanted to learn, the different starting blocks made the end of the race difficult to find. We embraced this challenge head on, and used it to change our model from one larger group to smaller, more tailored groups of equal ability. This has already improved the learning and teaching process. Our second challenge was developing the independent learning skills of our pilot teachers. Classroom learning is still the predominant method of delivery for many Commonwealth countries, with learning from home taking a backseat. We have taken this as yet another learning opportunity for our teachers, and built independent learning into the course. We have added to this increased support both on the ground and remotely, ensuring that no one is left behind. Finally, we noted that though connectivity is improving by leaps and bounds in South Africa, there are still places where the internet and electricity cannot be relied on at all times of day. While trying to go digital is important both for the environment and for our teachers’ skills, sometimes traditional books and paper are needed. We introduced this into our programme, alongside memory sticks with downloaded materials, ensuring that connectivity was never a barrier to learning. Importantly, one teacher noted that Teach2030 ‘helps me improve the way I teach in the classroom. I know that learners have different learning styles. As a teacher I need to apply them to cater for my learners.’ As trainers, as teachers, as students – we are all different. 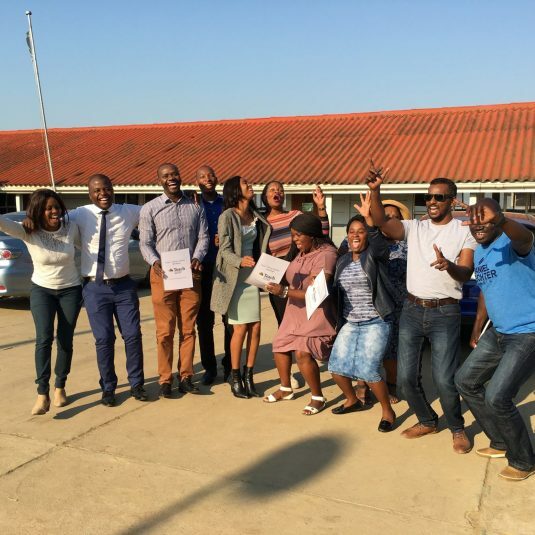 The differentiation and tailored approach of Teach2030 has both improved delivery of the course and taught participants how to improve their own classroom teaching. Here at CET we are aiming to not only improve teacher training, but support classroom development and education systems across the Commonwealth. As we continue to develop Teach2030 and better our model, we realise the strengths and opportunities we have to make a lasting impact on the education of young people in the Commonwealth. If we teach a teacher, we reach their students, creating a cascade of change.